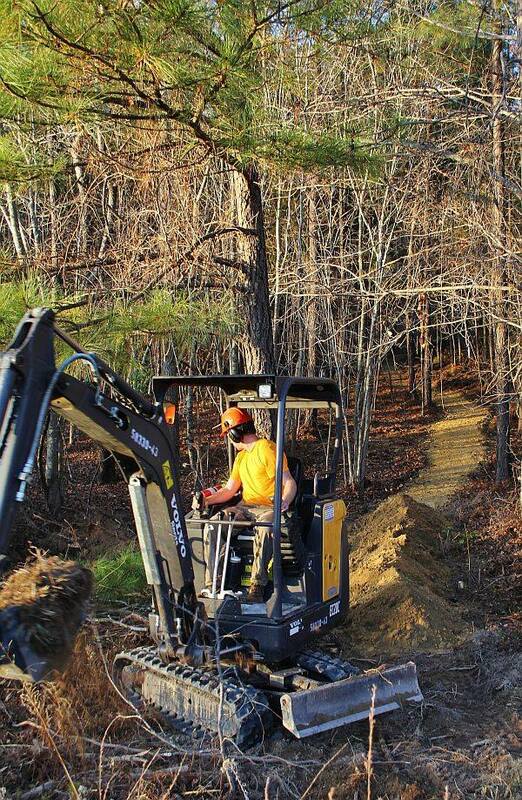 Next on Briar Chapel trail work….Elevated Trail Design starts working today! Elevated Trail Design will be starting work today on the section near Briar Chapel Parkway on out to 15-501. If they follow the design Native Trails, Briar Chapel land manager and TORC spoke about in our meetings, the trail will stay within the forest on the side of the power line corridor until the trail gets closer to private property where it will then dump out into the power line corridor and then loop around in that broader area using the hilly terrain for some ‘flow trail’ and then connect back to the ‘out n back’ connector trail for the return. There is not enough width for a separated loop and will need to be an out and back with a loop at the end. Should be around 1.5 miles as an out and back. Here is the pdf again where you see the trail in yellow just off of Briar Chapel Parkway as you come in off 15-501 going West.